Sunrise in the "House of the Sun"
Early Hawaiians applied the name Haleakala ("House of the Sun") to this impressive volcano in the middle of the Pacific Ocean. 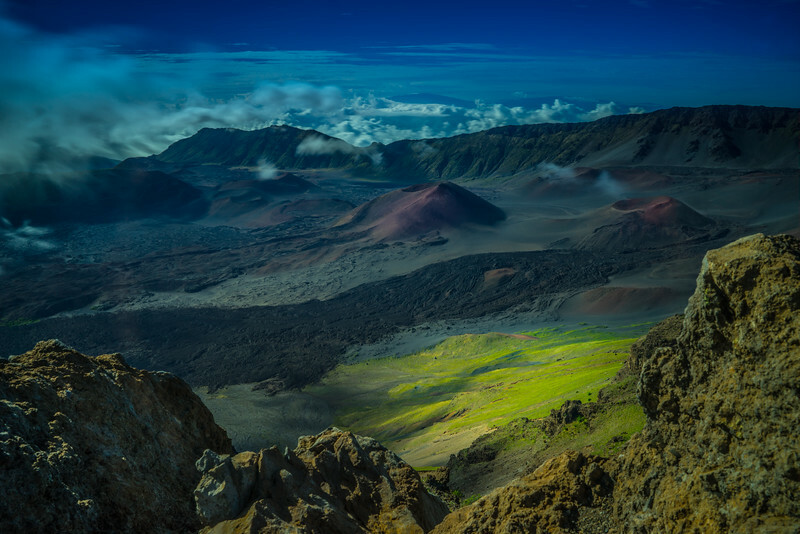 After spending one entire and chilly night on the peak of the 10,023 feet or 3,055 m high Haleakala shield volcano this picture offers an “Early Bird view” into what is for me one of the most impressive places on earth, the Haleakala crater. Clouds were rushing through the crater and fully blocking the views from one second to the other, but I was lucky to get this clean shot, with just some hint of clouds in “blurred motion”.